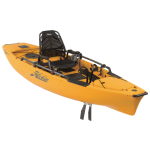 Hobie Kayaks folks say "The World Is A Water Park, And Since 1950 We've Made The Best Rides." They sure did bring live-fast, have-fun, adventure to the world. 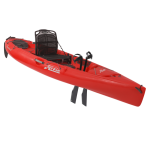 The biggest difference that Hobie Kayaks bring to the sport of kayaking are pedals. 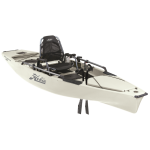 Each of Hobie Mirage models has either a patented MD180 Drive or a Mirage Drive pedaling system. 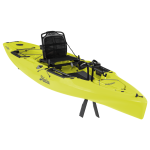 Its adjustable mechanism of a durable construction allows for “hands-free” experience, warm welcomed by many kayak anglers. 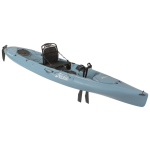 For more information on Hobie kayaks check out the Hobie website.